More time enjoying your pool and less time cleaning and maintaining it. Aqua Pool & Patio is Connecticut's foremost swimming pool builder and expert in self-cleaning pools, pool automation systems and cutting edge swimming pool technology. We know you want to maximize your time enjoying your pool and to do that we build smarter pools and spas that can self-clean and provide you with convenient features to manage your pool & spa from your mobile device. The following is our guide to the latest in inground swimming pool technology. Aqua Pool & Patio Inc. is the only distributor of Paramount PV-R self-cleaning systems in Connecticut and Western Massachusetts. We’ve been installed Paramount systems for more than 35 years and we believe PV-R is the best product on the market, from the leading manufacturer, Paramount Pool & Spa Products. Built right into the pool shell, Paramount PV-R is engineered to clean your entire pool, including floors, steps, benches, even spas. When not operating, PV-R disappears back into the pool floor, making it virtually invisible. There are no vacuum hoses left floating in the pool. All that’s left is a sparkling clean pool that’s ready to enjoy. PV-R is custom-designed for your unique pool shape. It is so effective that it will clean 99 percent of your entire pool, guaranteed, as well as significantly reduce heating and chemical costs for the life of your pool. It also saves money! In-floor systems are more than highly effective automatic pool cleaners. They also function as high-efficiency circulation systems. They are so effective that they have been independently certified to save up to 30% on chemicals and energy for the life of your pool. The MDX-R3 VGB compliant safety drain continually collects large debris directed to it from the patented debris collection zone. The automatic water valve functions as the brain if the system and direct a powerful flow of water to each set of cleaning jets. The water valve requires no routine maintenance and is also 100% pressure safe. You can now have complete pool automation with Jandy's iAquaLink pool automation system. iAquaLink allows you to control your pool anytime, anywhere. 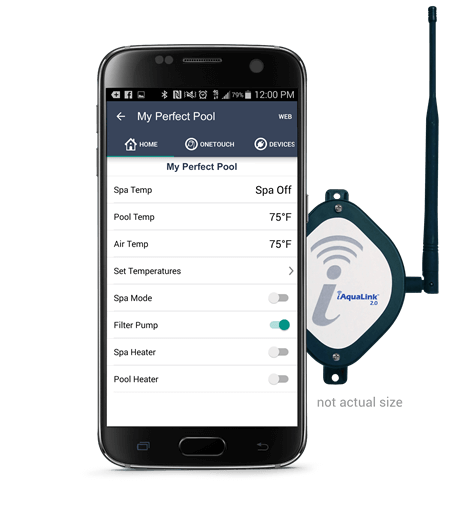 Using the free app for your smartphone or web-connected device, you can control all the elements of your pool or pool or spa system, even when you're on the go.